Cards featuring top Hearthstone players. Cards with Flava Flav. The "healing" tune from Pokemon centers. These are just some of the many possibilities that open up when Hearthstone is modded. YouTuber wellPaidHS actually figured out how to replace many of the in-game assets with other pictures, sounds and text of their choosing. 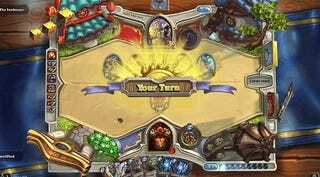 It makes Hearthstone into a way goofier game—even though the original function of the cards stays the same. "This doesn't change anything for the opponent or any of the interactions," wellPaidHS says on YouTube. "It's just more fun to play this way"
Though you see him use the cards against a bot in this video, streams show that he can bring the modded cards online, too—though that doesn't necessarily mean the other player can see the mod. Still: pretty cool, huh? I'm looking forward to seeing what other sorts of mods people come up with. I'd play the hell out of a full-on Pokemon mod, for example. One can dream!